Sliding back, locking case - SD213 - comes with three fixed inside shelves. Each case has a sliding door which slides upward when unlocked to give access to contents. Door has a lift handle, cam lock and 2 keys. 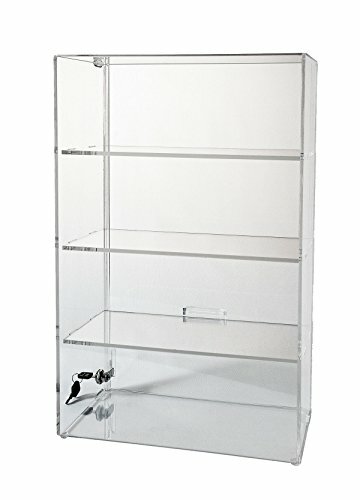 Display case is made for collectibles, store counter displays, dental and medical offices, jewelry displays, and offices and anywhere security is required. Fully assembled. Made in the USA and ships FREE to continental states. Jule-Art Brand products and Choice Acrylic Displays Brand products are sold on Amazon exclusively by Choice Acrylic Displays. Our products are 100% satisfaction guaranteed. All images and content for this listing are copyrighted 2013 - 2018 by Choice Acrylic Displays - All Rights Reserved. Jule-Art and Choice Acrylic Displays are trademarks of Jule-Art dba Choice Acrylic Displays. If you have any questions about this product by Choice Acrylic Displays, contact us by completing and submitting the form below. If you are looking for a specif part number, please include it with your message.